I will have to make a couple of posts to catch you all up since I have not posted since January. I am still trying to workout. I have had some pains here and there and I was sick a LOT in May, but I am hanging in there. My goal is to lose some weight and I am going to have to walk/jog longer to make that happen. I enjoy my treadmill and especially when I was working I enjoyed coming home and walk/jogging to clear my head. This has been a rough year at the preschool for a lot of reasons. I will not get into it, but so glad it is summer. I recently got some new shoes to help me with my aches and pains. 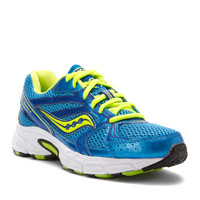 They are Saucony Cohesion 6. Here is a picture and this is the color I have too. I said I was sick in May. I mean I was sick back to back weeks. I had the flu one week for 2 days and the very next week I had a BAD cold I actually had to leave work and come home and sleep. I felt better when I woke up and was able to go back the next day. It was crazy, but I kind of needed some time off and I have plenty of sick days, so it was kind if a nice break even though I was sick. I got a lot of sleep. I also took off because Josh was sick at one point. I was off a lot in May. Josh had the flu also. Well, Josh graduated from 8th grade. I know if you follow facebook, you have seen the pictures. I am going to share a picture I did not post. It is of his awards. 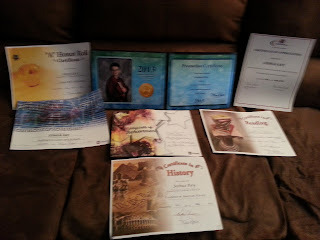 He won an award for best History and Reading grade and A Honor Roll one semester and A/B honor roll the second semester. He had some other awards, but I was so proud of his reading awards because the school wanted to retain him in 4th grade because of his reading level, so we pulled him out of public school for the year...had him do homeschool and then sent him to middle school the next year. He was caught up when he went back and now has all of these academic awards. I know I am bragging, but I am so proud of him. He has been beat down and had no confidence for so long. He is doing so good in school now. 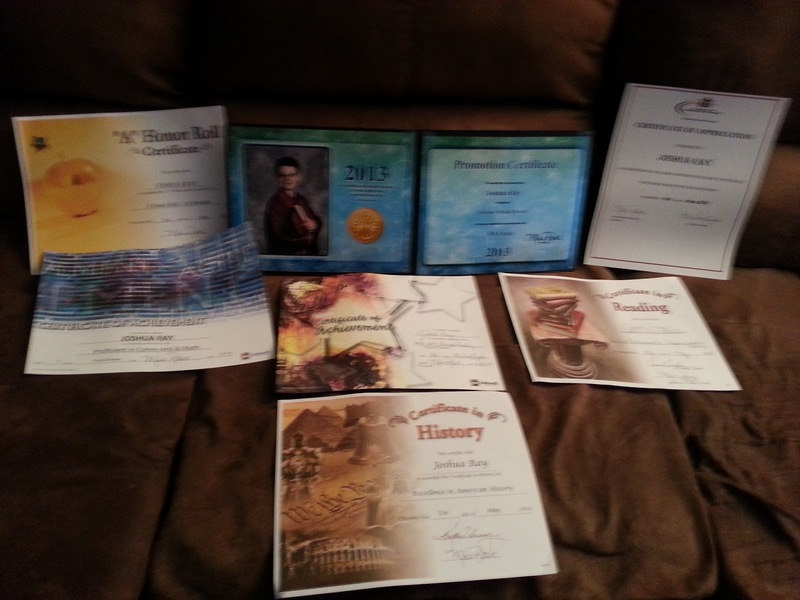 Here is the picture of his awards...one is his promotion certificate. Ok, well this is getting long. I have much more to share, but I will do that another day. I am looking forward to getting caught up with blogs!! See you soon. Wow! I guess I found your post just a few minutes after you finished writing it. What's the chances of that ever happening? So glad to see you posting again. Sounds like May was a rough month for you. Congrats to Josh. I can practically feel how very proud of him you must be. Just thrilled for him. Hope your summer goes good and please stay in touch. Hugz!! Sorry about being sick in May :( That is no fun at all. Congrats to Josh! On graduating and the honors. I know you are a proud Mama :) Hope you have a wonderful Summer ahead and I look forward to your posts! Hi Lori, thanks for your visit and support. Hey there. So happy and proud for Josh. Sorry to hear you had a rough May. Maybe summer will be better. Lori, that is great news about Josh! wow a great achievement for him. Wow! Congrats to Josh! He has really done well! Hope you're feeling 100% now!